I replaced the glow plugs on my 2000 Ford F250 Super Duty Powerstroke Diesel. I did the job with the help of Ford factory manuals and several other manuals, as well as other Internet resources. I decided to synthesize what had gleaned from the manuals, and from the practical experience of doing the job, into these instructions, which show how to do the job in 42 concise steps. I believe the procedure is the same for model years 1999-2004. This isn't a particularly hard job but it is rather tedious. Remember though, that I am not a mechanic, this is just how I did it. Before beginning this project, thoroughly read all you can about doing this project from whatever sources are available to you. What does it cost to have the glow plugs replaced? I'm not sure, but I've heard it costs over $1,000.00. If you do it yourself it will cost about $100.00. How long does it take to do this job? I did it a couple months ago, but I think it took me three or four hours. Keep in mind I was taking notes and pictures for this tutorial. The parts I used are listed below. I've heard good things about the Motorcraft glow plugs. I would not look at going cheap on the glow plugs because this job is a bit of a pain. If you would like to support my site, please consider purchasing your parts or tools (or anything else) through the Amazon links below (purchase must be made within 24 hours of clicking the link, you could always come back and click through again). These are the very products I used, and they are at a great price. I receive a small commission if you do, and would appreciate it tremendously. This is how I support this site. Thanks! The image below is for component identification (what I am calling various components). 2) Disconnect air the cleaner outlet tubing and filter housing top. Unclip the housing top and loosen the hose clamp on the air filter tube at the air intake tube bracket. A 5/16" nut driver works great for the hose clamps. Then just pull the whole assembly away. 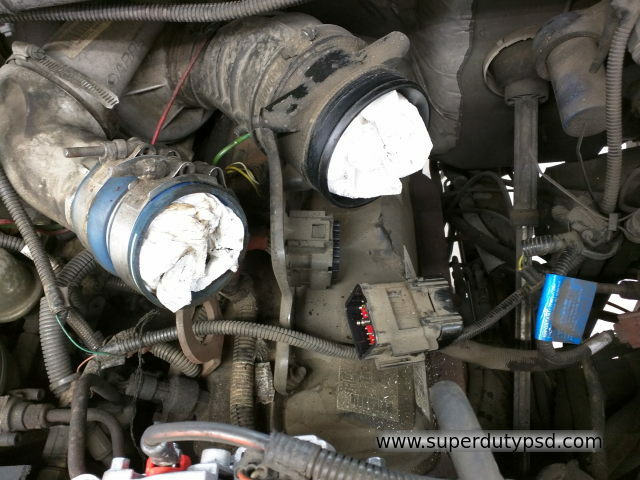 3) Remove driver's side charge air cooler (CAC) pipe. This is a little more difficult. 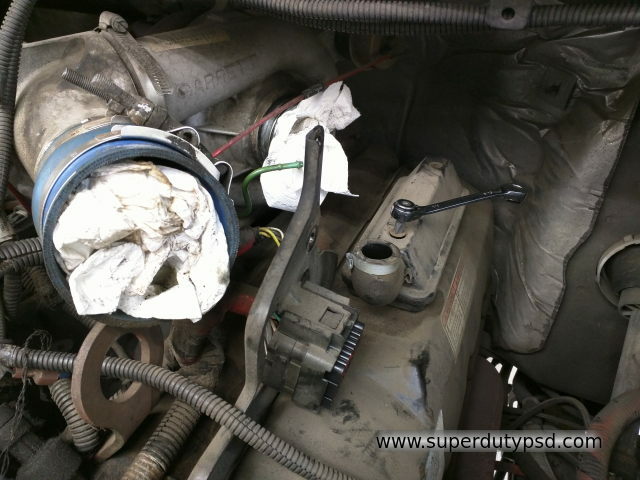 Loosen the t-bolt clamps on both ends of the pipe and work the pipe out of the engine compartment. 4) Disconnect the large electrical plug above the driver's side valve cover. This is done by loosening the bolt on the side of the plug and then pulling the plug apart. 5) Remove air intake tube and bracket. 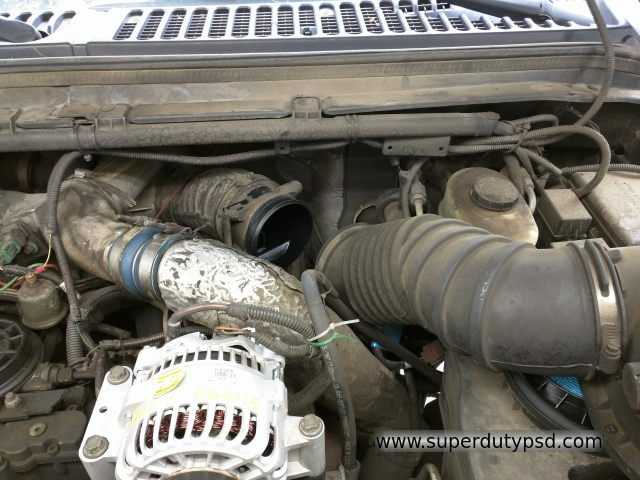 Remove the two bolts at the bracket and loosen the hose clamp at the turbo charger. The whole assembly can then be pulled up and away. Be careful because the intake tube is attached to the breather housing by a small hose. The air intake tube has to be pulled UP and away from the turbo. The green waste gate control tube also needs pulled out of the air intake tube. 6) Remove the breather from the top of the driver's side valve cover. There are two phillips screws that need to be removed. Note that there are two o-ring type gaskets under the breather. Don't lose them. 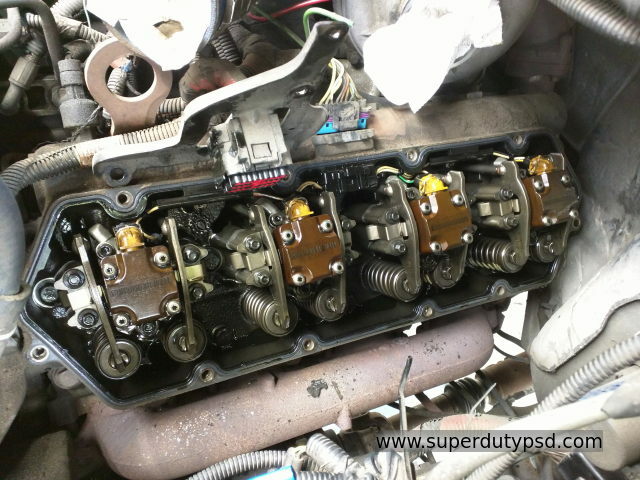 7) Remove the 10 valve cover bolts. 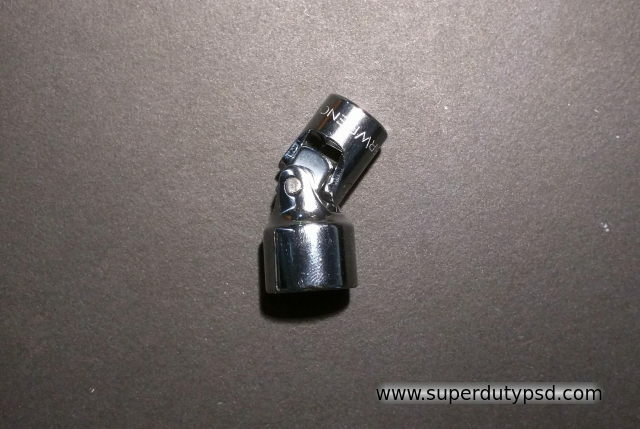 It is essential to have a 1/4" shallow well 13mm universal socket. I think this job would be impossible without one. 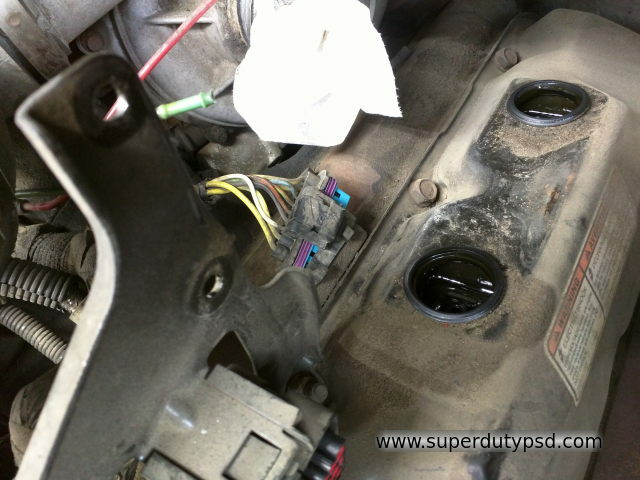 Be cognizant that the bracket which the air intake bracket and electrical plug connect to is attached by two valve cover bolt studs. 8) Remove the valve cover. Be careful not to disturb the o-ring and the gasket it seats into and you can likely reuse the o-ring and gasket. I did without issue. 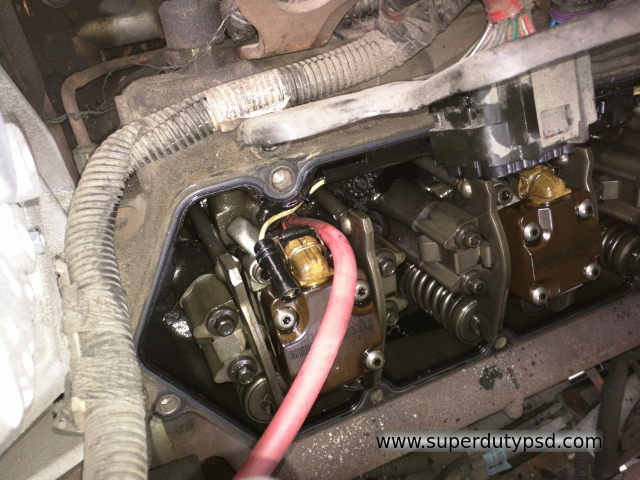 9) Pull the glow plug electrical connector located at the top center of the cylinder head off if you are replacing the gasket or would like to check its condition. In my case, the harness and all electrical connections were fine. I reused the harness. 10) Pull the electrical connection off the top of the glow plug. I used needle nose pliers to pull the electrical connection. Be gentle, the plastic wire ties can easily break. 11) Remove any oil from where the glow plug seats so it does not run into the cylinder. I used compressed air to blow the oil away. It was not too messy as there was little oil there. Obviously wear some safety glasses if you take this route. 12) Loosen the glow plugs with a 10mm deep socket and an extension. I could only back the glow plogs out so far before the top of the socket hit the fuel injector. 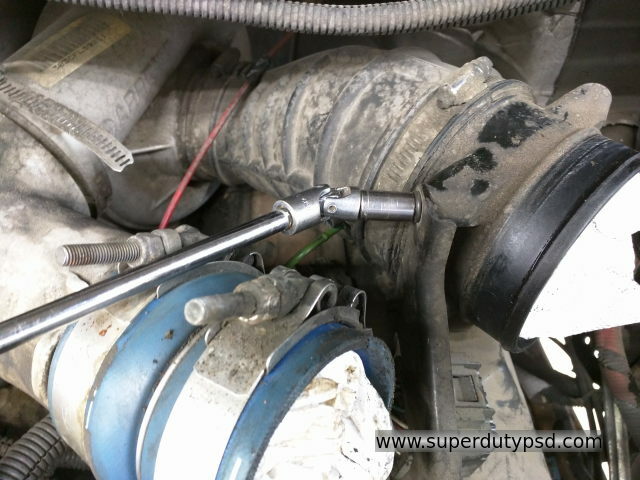 13) Turn the glow plug all the way out using a piece of hose. 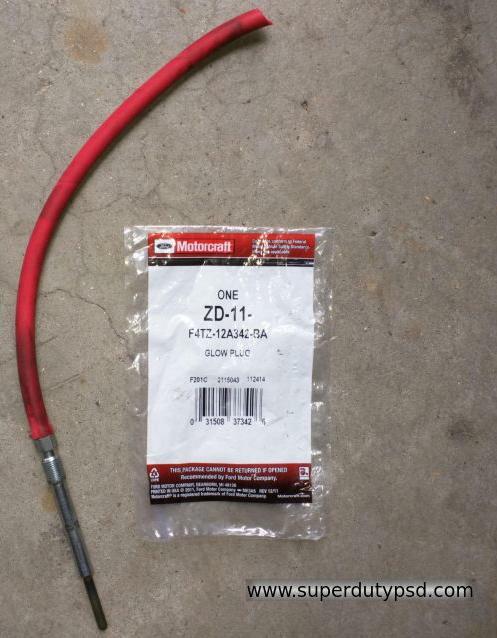 Just slide a piece of 3/8" ID hose over the top of the glow plug and use this to turn the glow plug out. It unscrews very easily. 14) Install new glow plugs. Use the same piece of 3/8" ID hose, slipped over the glow plug, to turn screw the new glow plug in. Finish tightening the glow plugs with a torque wrench and a 10mm deep well socket. They need to be tightened to 168 inch pounds (14 foot pounds) using a 10mm deep socket. 15) Clean mating surfaces of the valve cover and valve cover gasket o-ring and install valve cover. Tighten the 10 valve cover bolts to 98 inch pounds (8.17 foot pounds). 16) Reinstall valve cover breather. Tighten the phillips screws to 89 inch pounds (7.42 foot pounds). 17) Reinstall air intake tube and bracket. Don't forget to reconnect the green waste gate tube. 18) Reconnect the electrical plug and tighten its retaining bolt. 19) Reinstall charge air cooler (CAC) tube. 20) Reinstall air cleaner tubing and air filter housing top. 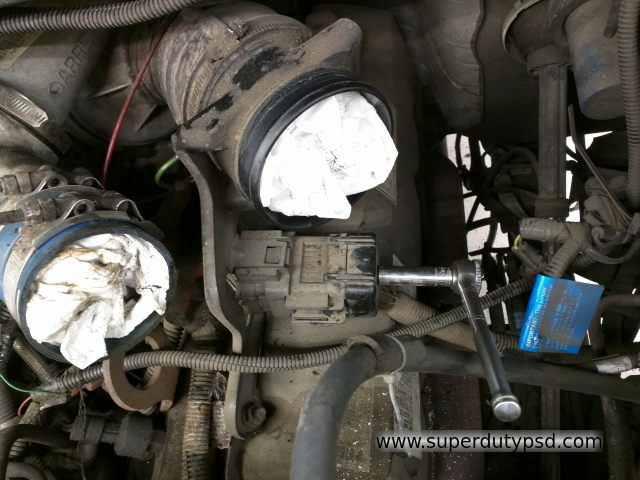 21) Disconnect the manifold absolute pressure (MAP) sensor electrical connector and hose. 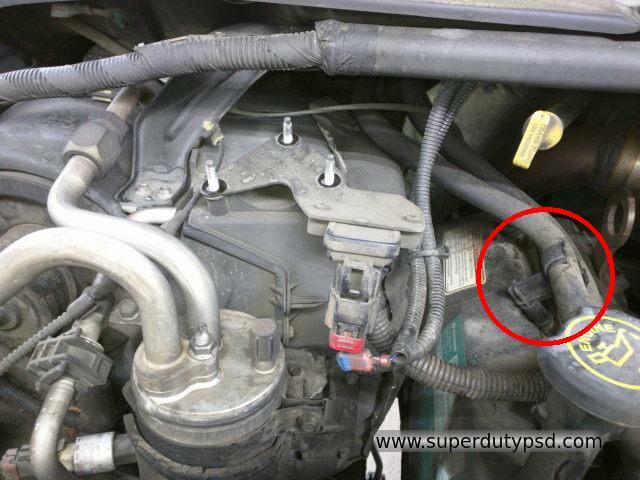 22) I did not pull the manifold absolute pressure (MAP) sensor hose off. I just moved the whole plate and sensor by removing the three nuts that hold it down. 23) Remove passenger's side charge air cooler (CAC). 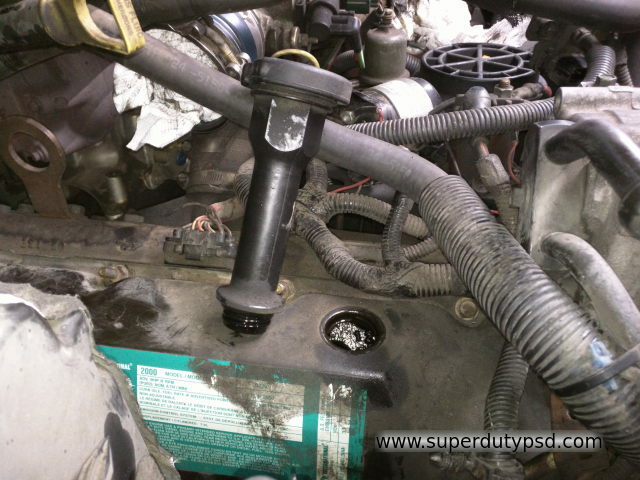 Loosen the t-bolt clamps on both ends of the pipe and work the pipe out of the engine compartment. 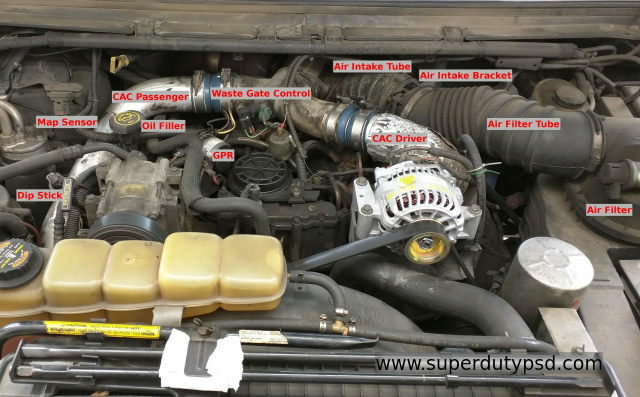 The passenger's side charge air cooler (CAC) is more difficult to snake out of the engine compartment than the driver's side. 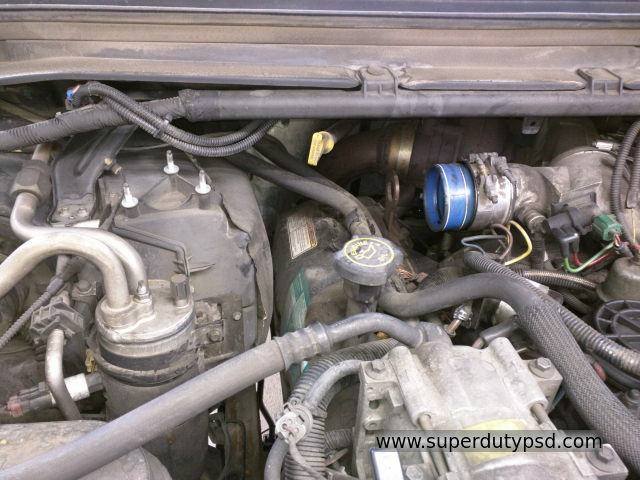 24) Unclip the coolant hoses above drivers side valve cover. Pull plastic coolant hose clips off valve cover studs. 25) Detach the wiring harness near the front end of the valve cover. 26) Remove the nut that holds the dip stick tube in place and move the dip stick tube out of the way. 27) Remove the oil filler tube. It just spins out. 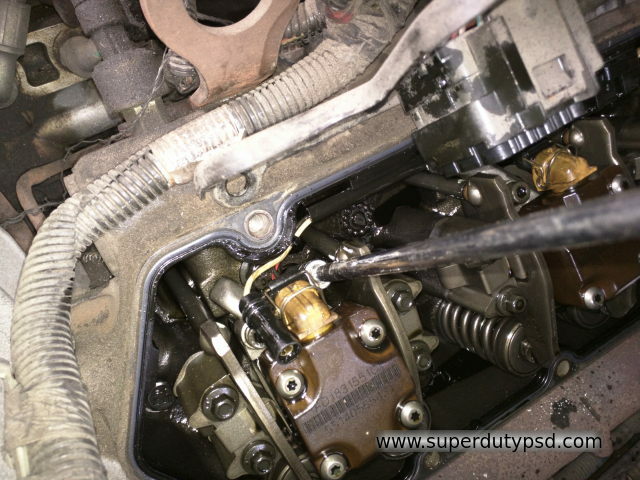 28) Remove the 10 valve cover bolts. Again, it is essential to have a 1/4" shallow well 13mm universal socket, particularly for the passenger's side. The lower rear valve cover bolts are tough to do and can be quite frustrating. 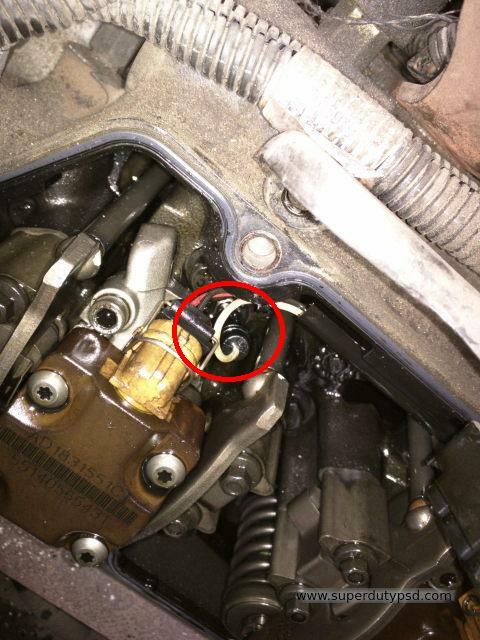 29) Remove valve cover being careful not to disturb the gasket or o-ring unless you intend to replace them anyway. The passenger's side valve cover is somewhat difficult to work away from the cylinder head. 30) Pull the electrical connection off the top of the glow plug as described previously in the article. 31) Remove any oil from where glow plug seats as described previously in the article. 32) Remove glow plugs as described previously in the article. 33) Install new glow plugs as described previously in the article. Use a 10mm deep socket and torque to 168 inch pounds (14 foot pounds). 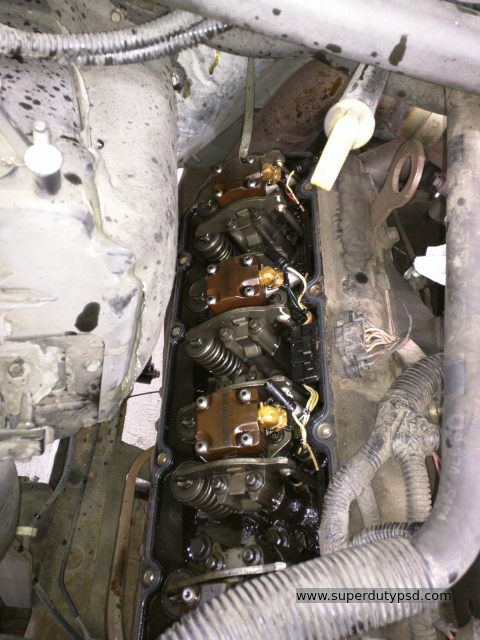 34) Clean mating surfaces of valve cover and valve cover gasket o-ring, install valve cover. The passenger's side valve cover is somewhat difficult to get back in place on top of the cylinder head. Tighten the 10 valve cover bolts to 98 inch pounds (8.17 foot pounds). 35) Reinstall oil filler tube. 36) Put dip stick tube back in place and secure it as it previously existed. 37) Resecure wiring harness at front of valve cover. 38) Reattach coolant hose plastic brackets and put coolant hoses back in place. 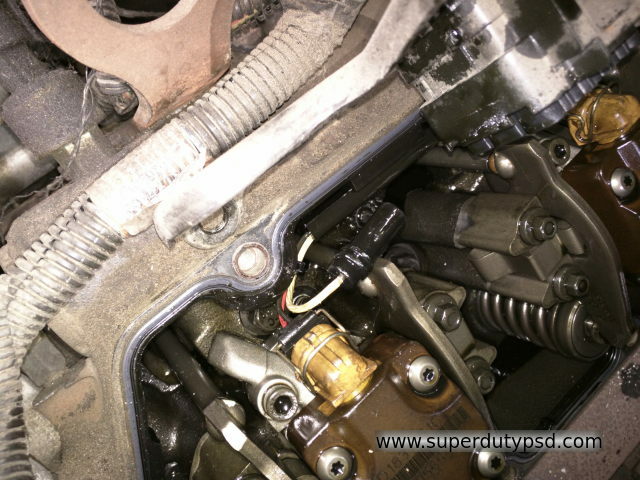 40) Reattach manifold absolute pressure (MAP) sensor bracket. 41) Plug in manifold absolute pressure (MAP) sensor wiring connector. That's about it for this one. Doing this as a DIY project can save a bunch of money. I sure am enjoying my easy starts on cold mornings.